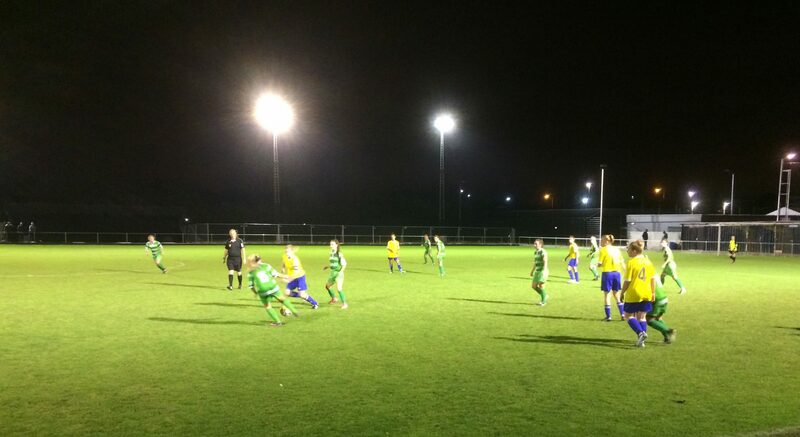 Under the lights in the Black Country, TNS Ladies came away with the three points as they saw off a determined Sporting Khalsa Women’s side. The Aspray Arena in Willenhall was the setting for a 2-0 win, as Kim Bebbington scored in each half to maintain the 100% start to the season. From our vantage point in the main stand, TNS Ladies began defending the goal to our left, as they got the game underway. With both sides looking to play football, after the opening minutes of bedding in to the game, it was the visitors who had the upper hand, certainly as far as corners were concerned, with three by the time the ten-minute mark was passed. One in particular was the result of a quality save from the Khalsa keeper, diving to her left. A quarter of an hour in though, the game remained goalless. As we passed the halfway mark in the first period, although still no goals, the home side forced their way back into the game, winning back-to-back corners in the 25th minute. The deadlock was broken nine minutes later. Good work down the right by Laura Morris saw a ball played into the box that eventually dropped to Kim Bennington, who slotted it past the keeper. Just two minutes into the second period, a free-kick taken by Chloe Wilkinson down TNS’ left was met by Bebbington, who grabbed her second of the game. With 71 on the clock, a fantastic long-range effort from Maddie Jones rattled the crossbar, as the visitors looked to put the tie to bed. Six minutes later, although the ball was in the back of the net this time, the assistant referee on the far side ruled it out as offside. As we entered the final five minutes, Khalsa went close but TNS cleared their lines as the comfortable two-goal cushion was maintained. The final whistle saw Andy Williams’ perfect start to his managerial career at Park Hall continue.